← I’m alive. So is the film. Invocation – or a chance encounter. I met and filmed many people on my journey. One person in particular was, and still is, a musician called James Radcliffe. He and his girlfriend Jen were following an old drovers trail from Skye to Crieff and they stopped for a night in a bothy located in the Lairig Leacach (Pass of the Flagstones) – a glen that forms part of an old drove road linking the Great Glen to Kingshouse at the gateway to Glen Coe. I arrived at the bothy on day 54 of my journey after climbing two nearby Munros (my 84th and 85th). A greyness had hung in the air since dawn and the surrounding mountain tops were obscured by a conveyor belt of cloud. During my ascent I saw a lone Rowan tree, almost horizontal, growing from a rock. I disturbed a herd of deer which dissolved into the mist like ghosts. I experienced what hard rain hitting eyeballs feels like. I sat at both summits and saw the cloud up close, whipped up into spirals and over rocks by the whistling wind. Everything was still grey, but greyer. It was good to be here though. My journey taught me early on that there’s more to climbing a mountain than simply reaching the summit to get a view. There is no denying that I’d have preferred to have been somewhere warm. Conversely, I was glad to be on a cold and wet mountain seeing and feeling nature instead of being detached from the world in some dingy basement office (and I’ve sure been there). On such occasions as these, I reasoned that a bit of temporary discomfort was a fair compromise. The bad times during my journey were offset by the good. The Sun would have to come out eventually. It was only a matter of time, whether hours or days. The darkness of winter is always replaced by the light of summer. Both should be accepted and embraced, I think. I had pitched my tent further down the glen earlier in the day but as I descended I saw smoke rising from the bothy chimney. I decided to change course and investigate in the hope of getting some warmth. I was welcomed inside by James and Jen plus a man called Chris who was travelling alone and they ushered me towards a plastic chair. They had tried starting a fire with the only wood available – a massive tree-trunk of a log. The smoke I had seen was their final attempt to ignite it using scraps of twigs. They had given up. Barely having sat down, I left and waded up the gully of a nearby river. There are usually trees in gullies and sure enough I found some that provided enough wind fallen and dead branches to get a fire going. Back at the bothy I drank coffee offered by Chris. I ate food cooked by Jen – noodle soup with fresh broccoli. Vegetables were a rare treat on my trip. We warmed ourselves by the fire and spent the evening deep in conversation. Strangers in fellowship. It quickly got dark and, being tired and at least a half hour walk from my tent, I left them by the fire, bid them goodnight and walked into the darkness. 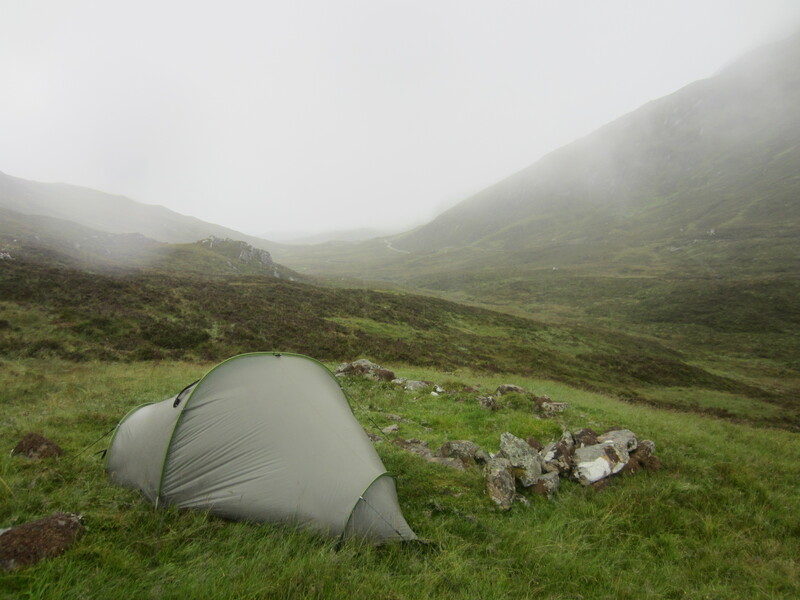 The following morning, I sensed that I should go back to the bothy despite it being the wrong direction for me. James had brought up some interesting points in our conversation and I was annoyed with myself that I hadn’t taken the opportunity to film him the previous evening. When I arrived, Chris was leaving. James and Jen were still packing up. James made me some coffee and I filmed a short conversation with him about nature, life, connection. We exchanged contact details and went our separate ways. We have since remained in touch and met up a few times in Edinburgh. I recently suggested editing some of the footage I captured on my journey to some of his music, not for the film but just for fun. He wrote a new piece called Invocation (available here) and I put the images together – and so below is the result of a chance encounter that happened via my ascent and descent of cloud-covered hill tops above the Lairig Leacach on a grey September day.